The sheet is made from 100% 200 thread count pure cotton and is available in a variety of colours and will fit perfectly onto your touring caravan fixed bed - No more hassle trying to tuck your standard size sheet in that just never quite fits. 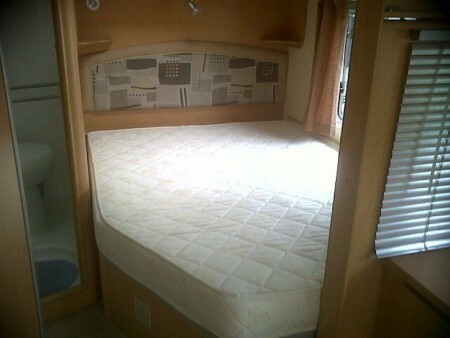 The sheet will fit most models of Lunar caravan double cut-off fixed beds. Being made of 100% cotton, the superb quality sheet is beautifully soft to the touch. The quilted mattress covers have been made to the highest standards with 250 gram polyester, a quilted construction to keep filling evenly in place after many washes and a fully elasticated skirt. The super deluxe cover has a 100% cotton cover and backing. The waterproof cover's backing is sure to keep to your caravan mattress in great condition. Which type of bed does your caravan have? Simple - just stand at the foot of the bed and face towards the head - if the cut-off is to your left, then you want a left hand cut-off sheet, if it is on your right hand side then you need a right hand cut-off sheet. If the bed has a curve on each side then an island sheet will be the one for you. Click the button below to add the Lunar Caravan Bedding - 100% Cotton Sheets and Mattress Covers to your wish list.